Bezos, Gates and Buffett are still on top on the annual Forbes Billionaires list. But a 'real animosity' is growing against the billionaire class in the United States, Forbes Assistant Managing Editor, Luisa Kroll, tells Reuters. For the full list: www.forbes.com/billionaires. 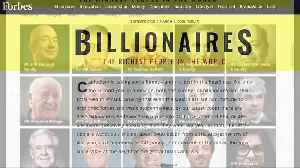 ROUGH CUT (NO REPORTER NARRATION) STORY: Billionaires as a whole may have lost a bit of their reach and wealth in 2018, but the heavy hitters are still on top, according to Forbes Magazine The business publication released its 33rd annual World Billionaires List Tuesday (March 5). Indeed, there are 2,153 billionaires on the 2019 list, down from 2,208 in 2018. The total combined net worth of this year's billionaires is $8.7 trillion, down from $9.1 trillion in 2018. The drop-off is of a piece with how the world's richest are being viewed at the moment, Forbes Magazine Assistant Magazine Editor, Luisa Kroll, told Reuters in an interview. "I definitely think that we are in a bad moment for the very rich. For the first time, I've been tracking the wealthiest for way too long and really for the first time this year we've seen a real animosity. But you see a vehemence against these people because of the wealth inequality that we see in the world," said Kroll. With a net worth pegged by Forbes at $131 million, Jeff Bezos topped the list for the second year in a row. 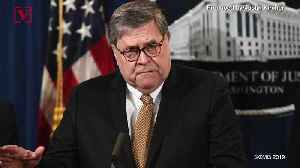 But he's been as much in the headlines of late for his saber rattling with the National Enquirer, marital woes and Amazon's balk in placing its HQ2 in New York as for his wealth. "His wife MacKenzie, soon to be ex-wife, actually drove cross-country with him when he went to start the company. 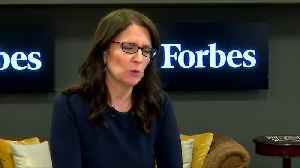 She was an early accountant at Amazon and given the laws in Washington state, she could end up with half of his stake in Amazon." The next two spots were occupied again by Bill Gates and Warren Buffett. Gates saw his net worth increase by $6.5 billion to reach $96.5 billion over the past year, thanks to the success of Microsoft's stock. The Oracle of Omaha saw his net worth fall to $82.5 billion, down by $1.5 billion from last year. Donald Trump, for his part, has famously monitored his standing in the world's billionaire's club, and he stayed at the same $3.1 billion as last year. "He kind of stayed flat but was able to increase his position," Kroll said. Bezos, Gates and Buffett are still on top on the annual Forbes Billionaires list. But a &apos;real animosity&apos; is growing against the billionaire class in the United States, Forbes..
Bezos, Gates and Buffett are still on top on the annual Forbes Billionaires list. But a 'real animosity' is growing against the billionaire class in the United States, Forbes Assistant Managing Editor,..